A black colt is born into a band of wild mustangs and soon learns that life can often be difficult. 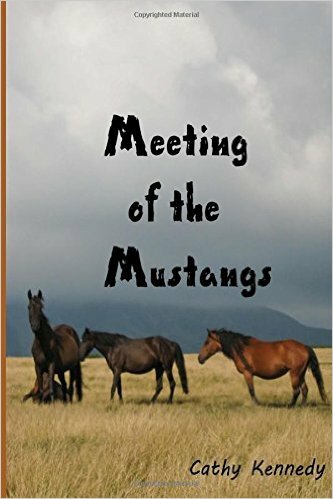 Follow his story as he goes from a free spirit to being captured for profit, and discover how one man gains the trust and extreme loyalty of a very special horse. The horse stories I read mostly have some danger in, althogh they usually have a happy ending and involve human friendships. This one is more horse focused than human focused. Humans are involved, and a ful range of kindness and cruelty is explored, but oh boy is it a powerful read. It feels like the Disney movie Bambi in several places, so have tissues at the reader and only read this when you are emotionally prepared for it. I couldn't stop readin as the tragedies unfolded. Gutwrenching is an understatement. In a way it reminded me of the series The Silver Brumby by Eleyne Mitchell and Peter Archer which I read loads when I was at school. There's something captivating about the writing that kept me turning the pages despite being scared for the characters. It was interesting learning about wild horses habits, the fun they have, as well as the variety of dangers. The ending is sweet and happy, although I did want to know what happened next, so maybe there will be a sequel. I don't yet know if I will reread it, as it is hardhitting, but I fully recommend it if you love animals, especially horses but I'm not a horse lover in real life. I adore the fictional variety!